The Buffalo Bandits obviously didn't need to change too much as the 2007 season approached. No one suggested that it was time to tear down the walls; a simple rearranging of the furniture would be fine. That started in June when A.J. Shannon was sent to Edmonton. Buffalo received a first-round draft pick for 2006, the third overall. The Rush picked up a first-rounder in 2007. The Bandits also acquired Kevin Dostie from Calgary for former first-rounder Jeff Shattler and a second-round pick in 2007. Meanwhile, the National Lacrosse League's expansion plans for 2007 were no secret. As early as February, it was reported that Chicago and New York were coming to the league. The Chicago team eventually would be known as the Shamrox. New York didn't have a name in July when the expansion draft was held for the two teams. Buffalo lost Bryan Kazarian and Jon Harasym to Chicago. In September, Buffalo took time out to honor two of its own. The League announced its selections for its Hall of Fame. Darris Kilgour, the coach and general manager of the Bandits, wasn't a big surprise, having been around the NLL in one capacity for another since Day One. "I had a relatively short career so I really didn't think I had that great a chance," Kilgour said. "Plus a lot of my career was spent in the penalty box so I didn't know how that would figure into it." Bufflao News' lacrosse writer Tom Borrelli was also included on the list. Borrelli had covered the team since 1993. In 2005, the league had named its writer of the year award after him. The pair was honored in Philadelphia before a Bandits-Wings game in February. In September's draft, San Jose had the first two picks and chose Ryna Benesch and Kyle Sorensen. The Bandits went third and picked Brett Bucktooth of Syracuse University, who would fit in quickly. Buffalo made one other addition for the season, making original coach Bob "Buff" McCready its goaltending coach. The games started on December 30, when the Bandits lost to Portland, 11-10 in overtime. It was part of a slow start for Buffalo, perhaps because goalie Steve Dietrich was out with a knee injury. Mike Thompson, who had been signed as a free agent and who hadn't played in the NLL since 2001, started the first five games -- including the home opener that drew a sellout of 18,690 on Jan. 12. One of the highlights of the early going came when John Tavares had a career-best 13 points (10 assists) in a 22-13 win over Minnesota. Dietrich finally saw action on Feb. 2, a home loss to Toronto, in a game that left Buffalo's Tavares fuming. "We were already short and they were calling very mediocre penalties," said Tavares, who had two goals and three assists. "It's very frustrating playing catch-up all night. It's demoralizing. I feel sorry for the 13,000 fans that were here. Every time we touched somebody we got a penalty. It got to be ridiculous." Dietrich started the next night in Toronto and lost that one. That put the Bandits' record at 2-4, but the team came around after that. "These last two games were more frustrating than even last year's championship," said Kilgour, referring to last May's penalty-filled 16-9 loss to Colorado. "We gave up the lead with absolutely selfish penalties over and over in the fourth quarter and we deserved every one of them. This weekend was absolutely unacceptable. I'm disgusted with my team right now." Rebounding smartly, Buffalo ran off eight straight wins to move to 10-4. It was the second-longest win streak in team history. 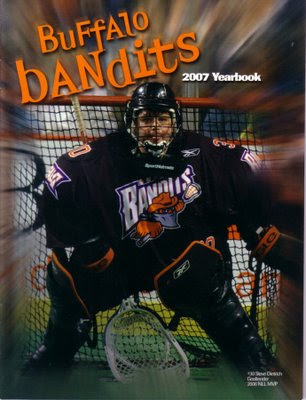 The Bandits even added some reinforcements along the way by giving up a first-round pick to Toronto for Phil Sanderson. The hot streak put the Bandits solidly in playoff position, with a chance to tie for the division in a home-and-home series with Rochester to close the regular season. "When were at 2-4 we realized if we wanted any chance for first we were basically going to have to win out," said Kyle Laverty, one of the Bandits' best backliners. "We're building every game, getting better. We're on a roll at the right time." That roll came to an end against Rochester. The Knighthawks took a 14-10 win in the opener of the series in Buffalo. Dietrich hurt his knee in that game. "My knee just buckled on me, they don't know what's wrong with it," said Dietrich. "They don't think it's anything structural. The kneecap may have dislocated and then popped itself back into place. There's not a lot of pain right now, so that's a good sign." The next night at home with nothing at stake they had an easier time, winning by 14-8. Rochester finished 14-2, the best record in the league, while the Bandits were 10-6. Tavares was picked for his 15th straight All-Pro team after a 103-point season, Dostie was second on the team in goals with 29. Bucktooth chipped in with 26 points. Buffalo drew Minnesota in the first-round playoff game on April 22. John Tavares had three goals and was the game MVP as the Bandits advanced with a 14-8 victory. Jason Crosbie had the killer goal of the night that put Buffalo up, 12-8. "You don't really plan it, that stuff just kind of happens when you take a chance," said Crosbie. "I shoot a lot of underhanded stuff. I was looking for something knee-high, it just went under his stick. When I saw that red [light] go off, I was really pumped. That was probably a pretty big goal." Meanwhile, goalie Thompson was sharp in the nets as a sub for the injured Dietrich. "Throughout the season our confidence has spilled out onto me," said Thompson, who made 38 saves and blanked the Swarm the entire second half. "There wasn't any problem with my confidence. A couple of [the first four scores] were squeakers that I got a piece of. I just tried to calm myself down a little bit, it being my first playoff game. In the second half, everybody settled down." Rochester and its 13-game win streak were waiting in the semifinal on April 27. Still, Buffalo seemed to have things in control in the fourth quarter as it had a three-goal lead in the fourth quarter. Oops. The Knighthawks rallied for a 14-13 overtime win. Mike Accursi was the MVP for Rochester, while John Grant had the game-winning goal 26 seconds into the extra session. He beat Thompson, who had a remarkable 52 saves. "Throughout the game he [Grant] had a tendency to go the other way," said Thompson, who allowed only two total goals in the middle quarters when the Bandits forged their lead. "He came like a twister. He looks like he's shooting short [side] but he goes long to the far side. I thought I had it. It pinched between the ground and my leg but it squeezed through there. I didn't even see it go in." The Knighthawks were supposed to host the championship game, but the circus was in town ... literally. The NLL Board of Governors voted to move the game to Arizona, and the unfazed Knighthawks beat Arizona there, 13-11, to win the title. The crowds in Buffalo had returned, as every game attracted at least 12,000 fans and the average attendance was a shade over 15,000. Now the Bandits had to find away to reward that loyalty.